Description: This Shivastalam with a number of colorful legends is located in proximity to Tiruppurampayam, 16 km north west of Kumbhakonam, 2.5km west of Vijayamangai. It is on the southern banks of the river Kollidam. It is considered to be the 48th in the series of Tevara Stalams in the Chola kingdom located north of the river Kaveri. Legends: A hunter is said to have unknowingly worshipped Shiva with vilva leaves on the night of Shivaratri; the same legend is associated with Omampuliyur. The Sapta Matas are said to have worshipped Dakshinamurthy here. There is also an image of Veenadhara Dakshinamurthy here. The Vedas in the form of Vilva leaves are also said to have worshipped Shiva here. There are no regular Dwarapalakas here, as according to legend they were sent to protect the devout hunter mentioned above. Bhramma and Vishnu are believed to be the Dwarapalakas here, and there are festival images for both. 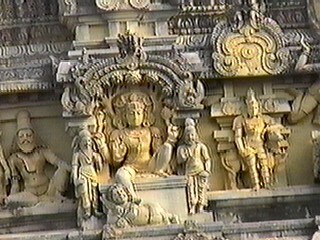 The Nandi faces the entrance portraying his attempt to subdue Yama who had come to bring the hunter's life to an end. This temple covers an area of about an acre. Images portarying the legend associated with the hunter are seen in the temple. The Ambal shrine is said to be of great significance. The original temple of brick and mortar dating back to the Pallava period was renovated later by Kulottunga Cholan in the 11th century. Sambandar is said to have visited Vijayamangai before visiting Vaikavur. Festivals: Two worship services are offered each day, Sivaratri is celebrated in great splendor here as in Sree Sailam, Sree Kalahasti and Gokarnam.